A month or so back, Elmo came to mind - Walker isn't in daycare and doesn't watch cartoon TV, so he really hasn't been introduced to many "characters" so far...however he does have a stuffed Elmo who sleeps in his bed and every morning is pointed out as "elmo" by Walker himself. Just seemed like a logical choice and fitting for 2 as well...I'm guessing they won't share a cake for very many more years, as boy & girl things prevail, but this year didn't sound like a bad plan. I tend to be a bit of a procrastinator (though I'm working on it, I promise! ), so I finally started looking at cakes online...the Elmo ones we found just weren't at all what I envisioned...so I decided, what the heck...let's just go for it! Elmo has a pretty simple face...surely he can't be that hard to make...and thankfully he wasn't! We started the night before by baking 2 round yellow cakes and we colored the coconut red. Using a LOT of gel food coloring we were able to get a really good, dark red color which really helped me think we could pull this off! We used Walker's Elmo to help us draw a template which we then cut out to help guide us. It did seem like we dragged an awful lot of kitchen gear out for this project, but a lot was never used or only used to help find the right diameter circle when drawing our template, so that made for quick easy clean-up aftewards! The Kitchenaid mixer came in handy both for mixing the cake and also coloring the red icing. We then mixed up red icing...never did get red enough for my liking, but at least it gave a decent red base to Elmo's color. Because we had baked the cakes the night before, they were completely cool and didn't crumb at all while icing them - hallelujah - that is usually one of my biggest issues icing a cake!!! And then the coconutting began! It was actually a very fun part of the process - we used the mouth template to keep Elmo's mouth free of coconut. Next came chocolate sprinkles for the mouth - we started out using our overall template, but then realized that the coconut had formed a bit of a well for the mouth, so the template was really unnecessary. The spoon made for easy delivery and fairly accurate sprinkle placement. We started out icing the nose off of the cake, and finished it off using a ziploc bag as a piping bag with icing in it and the tip of a corner cut out. That worked so well, that we did the eyes entirely using that method, and then used a knife to even things up. We then made a paper cylinder and used it as a template to drop sprinkles onto the middle of the eyes - no pics of that - it was kinda a critical point, if you know what I mean! And VOILA - the finished product - not perfect, but certainly pretty darn good for two novice cake bakers! I should stop here to further issue thanks and credit to my sweet, wonderful husband. This was a project I took on completely by myself, but true to form, he didn't let/make me tackle it that way. Brad was super-involved and super-helpful throughout this entire process. He baked the cakes and made the entire decorating process go so much more quickly and smoothly than if I'd done it myself! Yea for a wonderful husband!! And a side-by-side - I just couldn't help myself! ;) We picked Walker up to show him the cake and asked him who it was and he said 'Elmo' - just what this Mama wanted to hear! Made my day! We used a few of the cake remnants to decorate a little triangle for each baby. True-to-form, after the candles were out, Walker jumped down in the floor to play with his 'bobtat' and Alexa picked hers up and took a bite out of it. So funny! 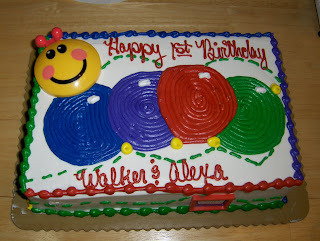 Walker did finally stick a finger in his icing when we picked him up, but that was pretty much it for him. Too much action going on for him to be interested in cake!